A photomicrograph of a plagioclase crystal under cross polarized light. The plagioclase crystal shows a distinct banding effect called polysynthetic twinning. In volcanic rocks, fine-grained plagioclase can display a 'microlitic' texture of many small crystals. Plagioclase is a series of tectosilicate (framework silicate) minerals within the feldspar group. Rather than referring to a particular mineral with a specific chemical composition, plagioclase is a continuous solid solution series, more properly known as the plagioclase feldspar series (from the Ancient Greek for "oblique fracture", in reference to its two cleavage angles). This was first shown by the German mineralogist Johann Friedrich Christian Hessel (1796–1872) in 1826. The series ranges from albite to anorthite endmembers (with respective compositions NaAlSi3O8 to CaAl2Si2O8), where sodium and calcium atoms can substitute for each other in the mineral's crystal lattice structure. Plagioclase in hand samples is often identified by its polysynthetic crystal twinning or 'record-groove' effect. A mineral is, broadly speaking, a solid chemical compound that occurs naturally in pure form. A rock may consist of a single mineral, or may be an aggregate of two or more different minerals, spacially segregated into distinct phases. Compounds that occur only in living beings are usually excluded, but some minerals are often biogenic and/or are organic compounds in the sense of chemistry. Moreover, living beings often syntesize inorganic minerals that also occur in rocks. A solid solution is a solid-state solution of one or more solutes in a solvent. Such a multi-component system is considered a solution rather than a compound when the crystal structure of the solvent remains unchanged by addition of the solutes, and when the chemical components remain in a single homogeneous phase. This often happens when the two elements involved are close together on the periodic table; conversely, a chemical compound generally results when two metals involved are not near each other on the periodic table. Petrology is the branch of geology that studies rocks and the conditions under which they form. Petrology has three subdivisions: igneous, metamorphic, and sedimentary petrology. Igneous and metamorphic petrology are commonly taught together because they both contain heavy use of chemistry, chemical methods, and phase diagrams. Sedimentary petrology is, on the other hand, commonly taught together with stratigraphy because it deals with the processes that form sedimentary rock. 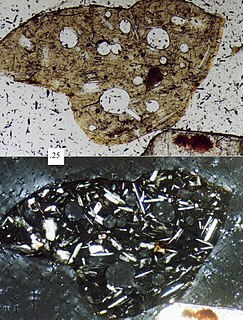 The composition of a plagioclase feldspar is typically denoted by its overall fraction of anorthite (%An) or albite (%Ab), and readily determined by measuring the plagioclase crystal's refractive index in crushed grain mounts, or its extinction angle in thin section under a polarizing microscope. The extinction angle is an optical characteristic and varies with the albite fraction (%Ab). There are several named plagioclase feldspars that fall between albite and anorthite in the series. The following table shows their compositions in terms of constituent anorthite and albite percentages. Anorthite is the calcium endmember of the plagioclase feldspar mineral series. The chemical formula of pure anorthite is CaAl2Si2O8. Anorthite is found in mafic igneous rocks. Anorthite is rare on the Earth but abundant on the Moon. Albite is a plagioclase feldspar mineral. It is the sodium endmember of the plagioclase solid solution series. It represents a plagioclase with less than 10% anorthite content. The pure albite endmember has the formula NaAlSi3O8. It is a tectosilicate. Its color is usually pure white, hence its name from Latin albus. It is a common constituent in felsic rocks. Anorthite was named by Gustav Rose in 1823 from the Ancient Greek meaning oblique, referring to its triclinic crystallization. Anorthite is a comparatively rare mineral but occurs in the basic plutonic rocks of some orogenic calc-alkaline suites. Albite is named from the Latin albus, in reference to its unusually pure white color. It is a relatively common and important rock-making mineral associated with the more acid rock types and in pegmatite dikes, often with rarer minerals like tourmaline and beryl. Prof Gustavus ("Gustav") Rose FRSFor HFRSE was a German mineralogist who was a native of Berlin. He was President of the German Geological Society from 1863 to 1873. The intermediate members of the plagioclase group are very similar to each other and normally cannot be distinguished except by their optical properties. The specific gravity in each member (albite 2.62) increases 0.02 per 10% increase in anorthite (2.75). Bytownite, named after the former name for Ottawa, Ontario, Canada (Bytown), is a rare mineral occasionally found in more basic rocks. Bytownite is a calcium rich member of the plagioclase solid solution series of feldspar minerals with composition between anorthite and labradorite. It is usually defined as having between 70 and 90 %An (formula: (Ca0.7-0.9,Na0.3-0.1)[Al(Al,Si)Si2O8]). Like others of the series, bytownite forms grey to white triclinic crystals commonly exhibiting the typical plagioclase twinning and associated fine striations. Labradorite is the characteristic feldspar of the more basic rock types such as diorite, gabbro, andesite, or basalt and is usually associated with one of the pyroxenes or amphiboles. Labradorite frequently shows an iridescent display of colors due to light refracting within the lamellae of the crystal. It is named after Labrador, where it is a constituent of the intrusive igneous rock anorthosite which is composed almost entirely of plagioclase. A variety of labradorite known as spectrolite is found in Finland. Andesine is a characteristic mineral of rocks such as diorite which contain a moderate amount of silica and related volcanics such as andesite. Oligoclase is common in granite, syenite, diorite, and gneiss. It is a frequent associate of orthoclase. The name oligoclase is derived from the Greek for little and fracture, in reference to the fact that its cleavage angle differs significantly from 90°. Sunstone is mainly oligoclase (sometimes albite) with flakes of hematite. Labradorite ((Ca, Na)(Al, Si)4O8), a feldspar mineral, is an intermediate to calcic member of the plagioclase series. It has an anorthite percentage (%An) of between 50 and 70. The specific gravity ranges from 2.68 to 2.72. The streak is white, like most silicates. The refractive index ranges from 1.559 to 1.573 and twinning is common. As with all plagioclase members, the crystal system is triclinic, and three directions of cleavage are present, two of which are nearly at right angles and are more obvious, being of good to perfect quality. (The third direction is poor.) It occurs as clear, white to gray, blocky to lath shaped grains in common mafic igneous rocks such as basalt and gabbro, as well as in anorthosites. Orthoclase, or orthoclase feldspar (endmember formula KAlSi3O8), is an important tectosilicate mineral which forms igneous rock. The name is from the Ancient Greek for "straight fracture," because its two cleavage planes are at right angles to each other. It is a type of potassium feldspar, also known as K-feldspar. The gem known as moonstone (see below) is largely composed of orthoclase. Trachyte is an igneous volcanic rock with an aphanitic to porphyritic texture. It is the volcanic equivalent of syenite. The mineral assemblage consists of essential alkali feldspar; relatively minor plagioclase and quartz or a feldspathoid such as nepheline may also be present.. Biotite, clinopyroxene and olivine are common accessory minerals. Andesite ( or ) is an extrusive igneous, volcanic rock, of intermediate composition, with aphanitic to porphyritic texture. In a general sense, it is the intermediate type between basalt and rhyolite, and ranges from 57 to 63% silicon dioxide (SiO2) as illustrated in TAS diagrams. The mineral assemblage is typically dominated by plagioclase plus pyroxene or hornblende. Magnetite, zircon, apatite, ilmenite, biotite, and garnet are common accessory minerals. Alkali feldspar may be present in minor amounts. The quartz-feldspar abundances in andesite and other volcanic rocks are illustrated in QAPF diagrams. Anorthosite is a phaneritic, intrusive igneous rock characterized by its composition: mostly plagioclase feldspar (90–100%), with a minimal mafic component (0–10%). Pyroxene, ilmenite, magnetite, and olivine are the mafic minerals most commonly present. 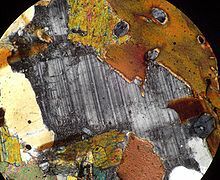 Aplite is an intrusive igneous rock in which the mineral composition is the same as granite, but in which the grains are much finer, under 1 mm across. Quartz and feldspar are the dominant minerals. The term 'aplite' or 'aplitic' is often used as a textural term to describe veins of quartz and feldspar with a fine to medium-grain "sugary" texture. Aplites are usually very fine-grained, white, grey or pinkish, and their constituents are visible only with the help of a magnifying lens. Dykes and veins of aplite are commonly observed traversing granitic bodies; they occur also, though less frequently, in syenites, diorites, quartz-diabases and gabbros. 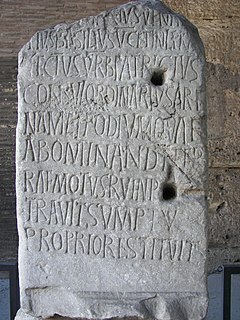 The scapolites (Gr. σκάπος, rod, and λίθος, stone) are a group of rock-forming silicate minerals composed of aluminium, calcium, and sodium silicate with chlorine, carbonate and sulfate. The two endmembers are meionite (Ca4Al6Si6O24CO3) and marialite (Na4Al3Si9O24Cl). Silvialite (Ca,Na)4Al6Si6O24(SO4,CO3) is also a recognized member of the group. Granulites are a class of high-grade metamorphic rocks of the granulite facies that have experienced high-temperature and moderate-pressure metamorphism. They are medium to coarse–grained and mainly composed of feldspars sometimes associated with quartz and anhydrous ferromagnesian minerals, with granoblastic texture and gneissose to massive structure. They are of particular interest to geologists because many granulites represent samples of the deep continental crust. 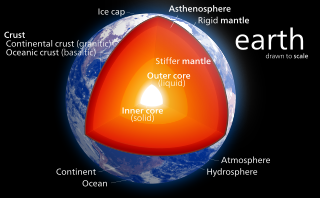 Some granulites experienced decompression from deep in the Earth to shallower crustal levels at high temperature; others cooled while remaining at depth in the Earth. Oligoclase is a rock-forming mineral belonging to the plagioclase feldspars. In chemical composition and in its crystallographic and physical characters it is intermediate between albite (NaAlSi3O8) and anorthite (CaAl2Si2O8). The albite:anorthite molar ratio ranges from 90:10 to 70:30. Andesine is a silicate mineral, a member of the plagioclase feldspar solid solution series. Its chemical formula is (Ca, Na)(Al, Si)4O8, where Ca/(Ca + Na) (% anorthite) is between 30%-50%. The formula may be written as Na0.7-0.5Ca0.3-0.5Al1.3-1.5Si2.7-2.5O8. Myrmekite describes a vermicular, or wormy, intergrowth of quartz in plagioclase. The intergrowths are microscopic in scale, typically with maximum dimensions less than 1 millimeter. The plagioclase is sodium-rich, usually albite or oligoclase. These quartz-plagioclase intergrowths are associated with and commonly in contact with potassium feldspar. 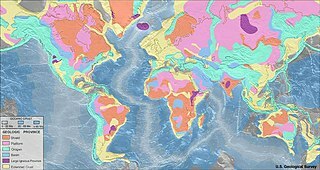 Myrmekite is formed under metasomatic conditions, usually in conjunction with tectonic deformations. It has to be clearly separated from micrographic and granophyric intergrowths, which are magmatic. ↑ Milam, K. A.; et al. (2010). "Distribution and variation of plagioclase compositions on Mars". Journal of Geophysical Research: Planets. 115 (E9). doi:10.1029/2009JE003495. Wikimedia Commons has media related to Plagioclase . Look up plagioclase in Wiktionary, the free dictionary.